Glaucoma is a disease of the eye in which the pressure within the eye, called the intraocular pressure (IOP) is increased. Intraocular pressure is measured using an instrument called a tonometer. What is intraocular pressure and how is it maintained? The inside of the eyeball is filled with fluid, calledaqueous humor. The size and shape of the normal eye is maintained by the amount of fluid contained within the eyeball. The pressure of the fluid inside the front or anterior chamber of the eye is known as the intra-ocular pressure (IOP). 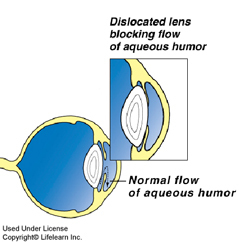 Aqueous humor is produced by a structure called theciliary body. In addition to producing this fluid, the ciliary body contains the suspensory ligaments which hold the lens in place. Muscles in the ciliary body pull on the suspensory ligaments, controlling the shape and focusing ability of the lens. Aqueous humor contains nutrients and oxygen that are used by the structures within the eye. The ciliary body constantly produces aqueous humor, and the excess fluid is constantly drained from the eye between the cornea and the iris. This area is called the iridocorneal angle, the filtration angle or the drainage angle. "Glaucoma is caused by inadequate drainage of aqueous fluid..."
Glaucoma is caused by inadequate drainage of aqueous fluid; it is not caused by overproduction of fluid. Glaucoma is further classified as primary or secondary glaucoma. Primary glaucoma occurs due to an anatomical abnormality in the eye, particularly in the drainage angle, and results in increased intra-ocular pressure in an otherwise healthy eye. 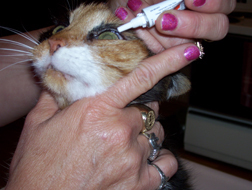 Primary glaucoma is rare in cats. Uveitis (inflammation of the interior of the eye) or severe intra-ocular infections, resulting in debris and scar tissue blocking the drainage angle. Anterior dislocation of lens - The lens falls forward and physically blocks the drainage angle or pupil so that fluid is trapped behind the dislocated lens. Tumors can cause physical blockage of the iridocorneal angle. Intra-ocular bleeding - if there is bleeding into the eye, a blood clot can form and block the drainage angle, thus preventing drainage of the aqueous humor. Damage to the lens - if a lens ruptures, usually due to trauma, proteins from the lens will leak into the eye and cause inflammation, which results in swelling and blockage of the drainage angle. Why is an increase in intraocular pressure a problem? High intraocular pressure causes degenerative changes to occur in the retina and the optic nerve. 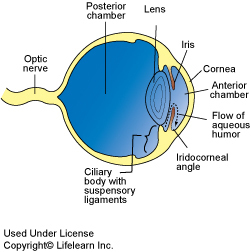 The retina is the innermost lining layer of the eyeball, located on the back surface. It contains the light-sensitive rods and cones and other cells that convert images into nerve signals. The optic nerve is the nerve that runs from the back of the eye to the brain, and it carries the signals from the retina to the brain, thus producing vision. Pain. Your cat's eye may be partially closed and you notice that your cat is squinting or rubbing at the affected eye. He may turn away as you touch him, especially near the side of his head. A watery discharge from the eye. This discharge is usually clear, and you often notice that your cat is also depressed and unresponsive. Obvious physical swelling and bulging of the eyeball. The white of the eye (sclera) looks red or bloodshot and swollen. The cornea or clear part of the eye may become cloudy or bluish in color. The pupil may be dilated. Blindness. Blindness can occur very quickly unless the increased IOP is reduced. "All of these signs can occur very suddenly with acute glaucoma. In chronic glaucoma they develop more slowly. They may have been present for some time before your pet shows any signs of discomfort or clinical signs." ACUTE GLAUCOMA IS AN EMERGENCY. If you notice ANY of these symptoms, it is important to bring your cat to the veterinarian for immediate treatment. Sometimes an emergency referral to a veterinary ophthalmologist is necessary. Diagnosis of glaucoma depends upon accurate IOP measurement and internal eye examination using special instruments. It is important to reduce the IOP as quickly as possible to reduce the risk of irreversible damage and blindness. It is also important to treat any underlying disease that may be responsible for the glaucoma. Analgesics are usually prescribed to control the pain and discomfort associated with the condition. Medications that decrease fluid production and promote drainage are often prescribed to treat the increased pressure. In severe or advanced cases, it may be necessary to perform surgery in addition to the medical treatment. Veterinary ophthalmologists use various surgical techniques to reduce intra-ocular pressure. In some cases that do not respond to medical treatment or if blindness has developed, removal of the eye (enucleation) may be recommended to relieve the pain and discomfort. Once glaucoma is diagnosed and medication is started, follow-up monitoring will be necessary. Initially, your veterinarian will recommend frequent follow-up examinations to ensure that your cat is responding adequately to the treatment, or to make adjustments to the medications. The prognosis depends to a degree upon the underlying cause of the glaucoma. In the long-term, constant medical treatment will be required to keep the disease under control. With medical treatment only, most patients will ultimately go blind in the affected eye. If the underlying cause of the glaucoma was a lens luxation, and the lens is surgically removed, then the prognosis is good. If the secondary glaucoma is caused by uveitis and the inflammation is able to be controlled, then the prognosis is good as long as treatment is maintained.